Before this tournament began I said I felt unworthy of writing previews but I'm so pumped for tonight's match I just had to blog something. First and foremost, at stake tonight is a place in the semifinals. There are three pools, and the winners are joined by the best runner up in the final four. But the way the first two rounds of games panned out, it is virtually impossible for Ireland to lose tonight and still make it, given both England and the USA have the maximum ten points in their pool. So there's only one way to spin Ireland's situation...tonight's match is a knockout quarterfinal. Lose and we are left fighting for the minor playoff places. But win, and hand on heart, I honestly believe anything is possible. We have a tendency in Ireland to be cautious for our sporting teams. After close contests against both Australia and Japan, a common theme among the post-match comments was 'we can't play like that against France'. Yes, that is true to an extent. We were very slow out of the blocks each time, and if France manage a 14-point cushion like Japan did, it will take a lot more heroics to claw it back in similar fashion. But what say we take that caution and throw it to the wind shall we. Taking into account key players that are unavailable particularly Niamh Briggs, this team we have out tonight is the best matchday 23 available to coach Tierney, and with the short turnarounds he has been forced into being careful with his team sheets up to now. 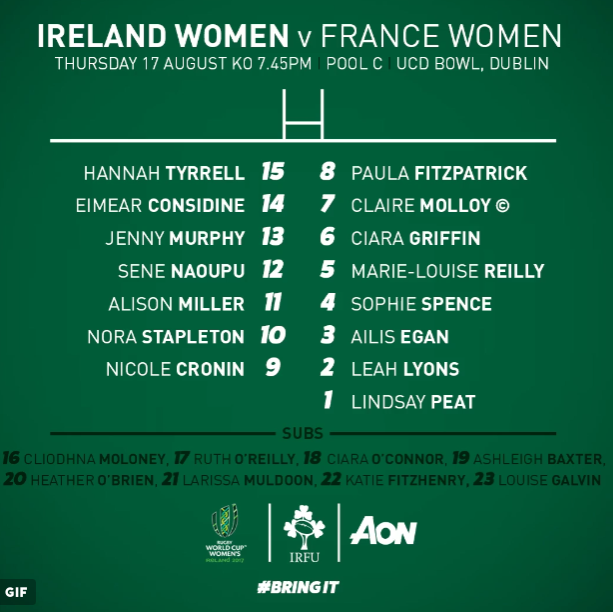 This time, we'll see Ireland with all their best combinations, ready to play their hearts out as we know they can, having seen so many heroics from them in the past. One name I failed to mention too often in my writeups so far has been Hannah Tyrell, and I regret this because she has been extremely solid so far and plays in Briggs' fullback position tonight. Then we have the return of tough-tackling Jenny Murphy to the midfield and her partnership with Sene Naoupu could be central (pun intended) to our chances. As for the pack, I certainly wouldn't change a thing. Keep the set pieces solid and if we can get the ground game going like before there's no limit to what we can do. What's needed most of all is for outhalf Nora Stapleton to find out quickly what options are working and go to them. Points on the board in matches like this are like gold dust, and we'll need them as early as possible too. I won't pretend I know a whole lot about the French but unlike us, they did make light work of both Australia and Japan. However, we have beaten them before, we have a full squad like I said, and what's the other thing we have going for us again? Oh yeah - IT'S AT HOME. Of course we can't all make it to Belfield tonight. Still though, I'd like to think this match could have sold out the RDS Arena - thanks to the showjumping folks I guess we'll never know. 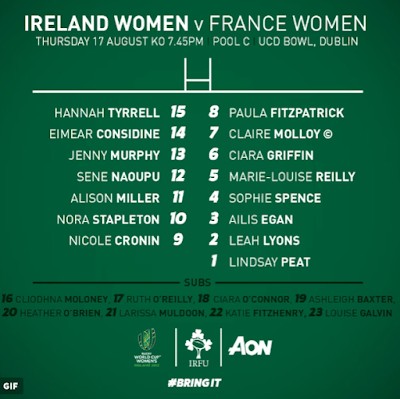 But surely it can't be that difficult for us as Irish rugby fans to get fully behind the girls tonight? We share all kinds of banal stuff on social media....would it be too hard for us to get on the #WRWC2017 and #BringIt hashtags and wish them all the best? FRANCE: Montserrat Amédée; Chloé Pelle, Caroline Ladagnous, Elodie Poublan, Shannon Izar; Caroline Drouin, Yanna Rivoalen; Annaëlle Deshayes, Gaëlle Mignot (capt), Julie Duval, Lénaig Corson, Audrey Forlani, Marjorie Mayans, Romane Ménager, Safi N'Diaye.